Our state-of-the-art printing equipment ensures high-quality custom T-shirt printing FAST on every order. Guaranteed! Check out our newest custom T-Shirt printing press: A custom t-shirt printing press with 12 heads and 14 stations! Say what? 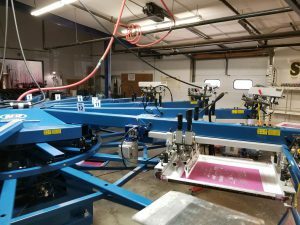 “That’s custom T-shirt printing lingo for a precision custom T-shirt printing machine that can print up to 12 colors on 14 stations loaded with T-shirts, hoodies, or other garments in just minutes,” explains Broken Arrow Production Manager Paul Leto. So why does that matter to you, our customers? Your artwork translates beautifully and precisely onto a full-color T-shirt print. Even complex designs with multiple colors will print beautifully and quickly. An automatic press enables us to print in multiple locations—the front, back and hem, for example—in much less time than a manual press, so you can be even more creative with your message and your branding and still get your shirts on time. We can print any size order, large or small, quickly and precisely to meet your needs. Because we can print beautiful custom T-shirts fast, we can deliver them to your door quickly. “Our latest press is an addition to the multiple presses and embroidery machines we already have working for you in our 30,000 square foot production facility. At Broken Arrow, we know that you, our customers are our most important assets and we appreciate your business,” Paul says.